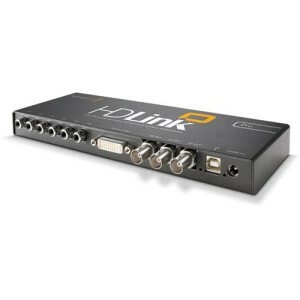 HDLink connects SDI video directly to any supported DVI-D and DisplayPort based LCD computer monitor for incredible true HDTV resolution video monitoring. HDLink includes 3 Gb/s SDI for high resolution 2K film monitoring when connected to a large 30 inch DVI or DisplayPort display. HDLink supports all DVI-D and DisplayPort based digital computer displays and also includes HDMI video support. HDMI supports video at 1080i/50, 1080i/59.94 and 720p/59.94 on any HDMI device. DVI-D and DisplayPort supports displays at 1920 x 1200 (16:10) resolution for all 1080 HDTV formats. When working in 720 HDTV formats you can even use lower cost 1280 x 800 resolution display for pixel for pixel 720p viewing. When working in NTSC or PAL, HDLink can scale to fill the screen making viewing easier. HDLink introduced the world’s first full HDTV resolution 4:4:4 monitoring solution that supports both standard definition SDI, HD-SDI and HD-SDI 4:4:4 for full resolution color monitoring. HD-SDI 4:4:4 features twice the color resolution. Conventional SD and HD video is 4:2:2 based, which limits color detail while 4:4:4 HD video preserves the full color detail which is important for critical keying and feature film work. HDLink supports all SDI based formats from standard definition NTSC/PAL to HD-SDI 1080 and 720 and even 2K film resolution when used with DVI displays. 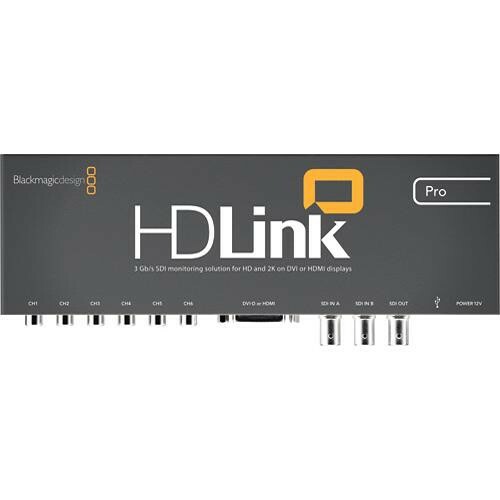 HDLink features 3 Gb/s SDI, so also works with real time 2K monitoring as used on Blackmagic Design’s Multibridge Eclipse, Multibridge Pro and DeckLink HD Extreme. With HDLink you’ll get the best image quality possible with format compatibility guaranteed years into the future. HDLink’s SDI video input automatically switches between SD, HD and 2K. Unlike CRT based monitors, HDLink also supports all HDTV frame rates and formats including progressive HD formats. For matching LCD display colorimetry and simulating various types of film stocks, HDLink Pro model features more advanced 3D lookup tables. Advanced 3D lookup tables increase color control because a blend of red, green and blue video can be output to each primary color on the connected display. Only advanced 3D lookup tables can give full color control for accurate simulation of almost any feature film stock. HDLink supports DVI-D and HDMI based digital computer displays. For 1080 and 720 HDTV formats, a 1920 x 1200 (16:10) resolution display is recommended. However, if you’re working in 720 HDTV formats only, then a lower cost 1280 x 800 resolution display is recommended. When working in NTSC or PAL, HDLink can scale up the displayed image to fill the display making viewing easier. Audio outputs are de embedded from the SDI input and then converted to analog at an incredible 24 bit. HDLink supports 6 channels out allowing easy monitoring of 5.1 surround sound audio. Audio is output on RCA connectors so you can easily connect to standard HiFi systems. If the connected display requires pull-down processing then HDLink will apply a variable audio delay ensuring perfect audio to video sync. To protect speakers and eliminate loud pops and other audio glitches, HDLink gently mutes the audio if video formats change or when SDI signals are connected and disconnected. Pixel for pixel HD resolution input to connected device. The world’s most advanced full resolution 2D/3D HDTV and 2K monitoring for DVI, DisplayPort and HDMI monitors. Includes the quality of 4:4:4 SDI video, lookup tables via USB and analog audio outputs. HDLink will solve all your monitoring needs. 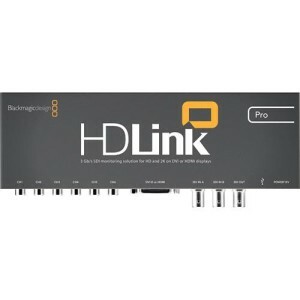 The HDLink Pro DVI from Blackmagic is an HDTV-resolution monitoring converter for DVI and HDMI monitors. Designed to eliminate the high cost usually associated with HDTV monitoring, it includes 6 channels of RCA analog audio out, 3D lookup tables, Dual Link 3Gbs SDI input, single link 3Gbs SDI loop-thru output, and support for 24″ displays for HD monitoring and 30″ displays for real-time 2K monitoring.